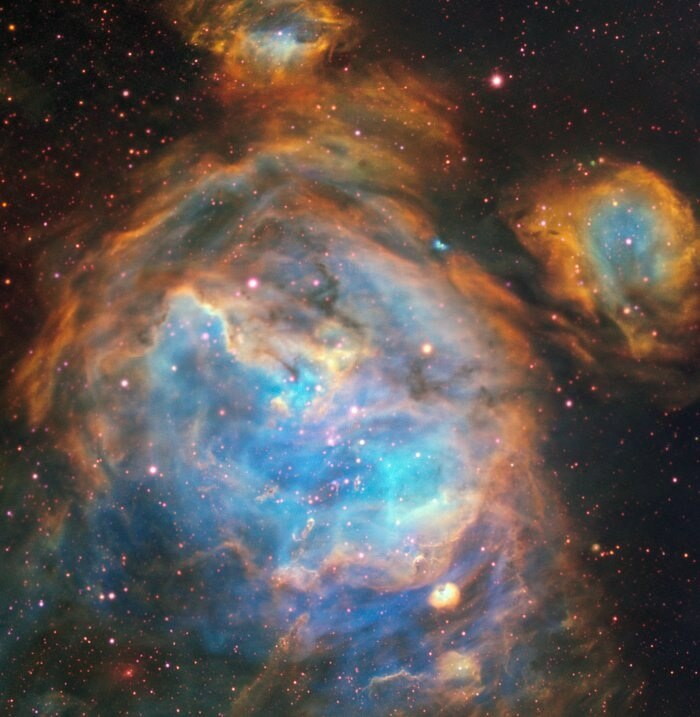 This stunning region of newly-developing stars in the Large Magellanic Cloud (LMC) was spotted by the Multi-Unit Spectroscopic Explorer instrument (MUSE) on ESO’s Very Large Telescope. The comparatively small quantity of dust in the LMC and MUSE’s acute vision enabled complex details of the region to be noticed in visible light. The image captured by the MUSE instrument on ESO’s Very Large Telescope (VLT) shows this region of the LMC glowing in remarkable colors. The region, termed as LHA 120-N 180B—N180 B for short—is a kind of nebula called an H II region (pronounced “H two”), and is an abundant source of new stars. The LMC is a satellite galaxy of the Milky Way, visible primarily from the Southern Hemisphere. At only about 160 000 light-years away from the Earth, it is virtually near Earth’s doorstep. As well as being near home, the LMC’s single spiral arm seems almost face-on, permitting man to study regions such as N180 B easily. H II regions contain interstellar clouds of ionized hydrogen—the bare nuclei of hydrogen atoms. These regions are stellar nurseries—and the recently formed massive stars are accountable for the ionization of the surrounding gas, which makes for a remarkable sight. N180 B’s distinctive shape is composed of a gargantuan bubble of ionized hydrogen enclosed by four smaller bubbles. Deep inside this glowing cloud, MUSE has detected a jet produced by a fledgling star—an enormous young stellar object with a mass 12 times greater than the Earth’s Sun. The image of a jet named Herbig–Haro 1177 (HH 1177) was also captured in great detail. This is the first time such a jet has been witnessed in visible light outside the Milky Way, as they are typically concealed by their dusty environments. However, the comparatively dust-free environment of the LMC enables HH 1177 to be seen at visible wavelengths. At approximately 33 light-years in length, it is one of the longest such jets ever detected. HH 1177 reveals the early lives of stars. The beam is extremely collimated; it hardly spreads out as it travels. Jets such as this are related with the accretion discs of their star, and can provide information on how young stars amass matter. Astronomers have learned that both high-and low-mass stars blastoff collimated jets like HH 1177 via similar mechanisms—suggesting that enormous stars can form in the same manner as their low-mass equivalents. MUSE has, in recent times, been greatly enhanced by the launching of the Adaptive Optics Facility, the Wide Field Mode of which saw first light in 2017. Adaptive optics is the process by which ESO’s telescopes make up for the distorting effects of the atmosphere—converting twinkling stars into sharp, high-resolution images. Since gaining these data, the incorporation of the Narrow Field Mode, has given MUSE vision almost as sharp as that of the NASA/ESA Hubble Space Telescope—providing it the potential to investigate the Universe in better detail than formerly possible.